Confessions of a Science Librarian: Are you a librarian? 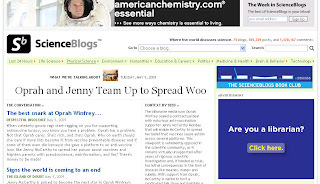 Such were the innocent words on the big ad on the ScienceBlogs site the other day. Well, I'm a librarian, I like the ScienceBlogs site quite a bit, so I clicked the link. 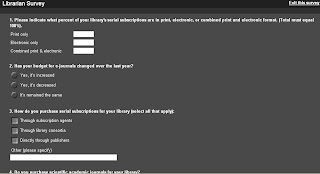 Lo and behold a librarian survey. "Hey", I think, "ScienceBlogs wants to know what I think about stuff!" To cut a long story short, it's not really a survey about what librarians think about science publishing, science blogs or ScienceBlogs. It's a marketing survey basically asking us if we subscribe to Seed Magazine (both Seed and ScienceBlogs are run by the same company). My library already does. As a nice reward for filling out the survey, they promised to send anyone who filled it out a ScienceBlogs coffee mug. At that point, I thought it was a fair trade and promptly posted a link to the survey on both FriendFeed and Twitter. And forgot about it. But, thanks to a couple of comments on Friendfeed from suelibrarian, especially "I got to a question related to whether I would consider purchasing a particular magazine then got out of it." I started thinking a bit more. At this point, it would probably be most useful to check out the FF conversation that resulted. Offended, annoyed, bemused, whatever. The point that came to mind from this particular bit of marketing was that Seed saw me as a librarian more in the cheque-writing role than in another possible role, that of a collaborator with publishers in the job of disseminating scholarly and other information about science and technology. More precisely, this incident has raised a number of questions I have for myself. Scholarly communications is changing, Open Access is growing, commercial publishers are holding on to their places fiercely, scholarly monographs are transforming (slowly), media is approaching a weird singularity. What are some of those questions? How do we want publishers to see us? What do we need to tell publishers about what we do? How do we form as strong ties to OA publishers as we have often done with toll access publishers in the past, both commercial and society? What would an OA publisher Library Advisory Group look like? How can librarians help publishers figure out what business model is most appropriate for them? What does a post-stuff library look like? What does a post-stuff librarian do? Lots of questions, of course, and not particularly any answers at this point. I'd be interested to hear any answers and/or questions from all of you out there. Maybe we can come up with some together. I filled out the survey, and found it pretty inoffensive, but I ignored the banner ad when I saw it initially. A free mug for less than 2 minutes of clicking is a pretty good deal IMO, and publishers obviously need to figure out how to target their customer base and if what they're doing is effective. In this case, what they're doing hasn't been effective. We have a decent collection of scientific journals, but I've never heard of Seed magazine. I wouldn't be opposed to getting some information from them about it so I can evaluate if it fits with our collection. I don't like being marketed to, but if I don't know what's out there I can't effectively serve my patrons, right? Actually, Kaitlyn, I don't mind being marketed to at all -- often the best way to find out what's out there is for the producers to just let you know. In this case, Seed is using a bit of stealth marketing -- marketing that doesn't seem like marketing at first. Now that's ok too. The point I'm trying to make with this post (and I guess not altogether successfully) is about how I feel about Seed's strategy, not whether it's a valid one to use to target librarians, because I think it is. My feelings are mixed as I wish they'd seen librarians as more than writers-of-cheques. Is Canada losing the lab-rat race?